Get a real feel for the countryside with laser clay shooting… This activity is completely safe; we use modified shotguns to fire lasers at clays launched from a conventional clay launcher. This outdoor activity is great for everyone; no matter what your ability, you’ll soon be able to hit the flying orange clay targets. When the trigger is pulled you’ll hear a 'bang', and if you hit the target, there’s the sound of a clay breaking. 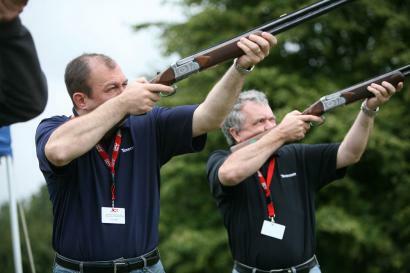 Five people line up to shoot at the clays, fired at various angles, at up to 60mph, 50ft above ground. When you hit a clay pigeon your score is instantly updated on our giant, live scoreboard – this really ramps up the competition as you fight to out-shoot the competition! Laser Clay Pigeon Shooting is one of the standard activity options in our Country Sports and Perfect Teambuild events, it also makes a brilliant addition to a Family Fun Day. There is no need for ear protection and there is no aggressive kick back from the guns. We need an area 30m x 10m to set up the event.